One of my favorite annual excursions has become the trip down to Portland for the Oregon Brewers Festival. This marks the 23rd year of the festival, and they’ve got things down pretty well by now. Hoards of people will visit the waterfront festival from Thursday, July 22 through Sunday, July 25. If you don’t like crowds, then get there early. This year they are advertising a lineup of 81 beers from breweries across the country. They’ll have plenty to offer that I’ve never previously sampled, and in addition they’ll have 47 rare/special beers pouring at various times throughout the week in their “Buzz Tent”. I’m really hoping to be around for certain buzz beers, including the fantastic Ballast Point Sculpin IPA and some of the many barrel-aged beers they’ll be offering. The festival itself is always a great time, and many of the local breweries and bars have special taps and events throughout the week. As always, a lot is going on in the Portland beer scene and we’ll have our hands full trying to do everything we’d like to. To make things as hassle-free as possible, we’re taking Amtrak down and don’t have to worry about driving the entire weekend. Sounds like a plan to me. Hop Valley Alpha Centauri Binary IPA – Hop Valley commemorated its 100th brew with this 100-IBU Imperial. The brewers mixed Galena, Simcoe, Cascade, Centennial and Amarillo hops in four additions, including a generous dose for dry-hopping, to give the beer intense pine and citrus flavors and aroma. They backed it up with plenty of 2-row and Munich malts to balance all those hops. Kona Coco Loco – Toasted coconut adds a sweet, nutty flavor to this dark, moderately hopped ale. Chocolate, Carapils, Munich and Victory malts add color, body and roasty flavor to the base 2-row malt. Warrior, Millennium, Cascade, Willamette and Mt. Hood hops put the Northwest into this tropical taste treat. The beer is also “dry-nutted” with additional coconut in the hop back. Lompoc Son of C-Note – If there’s a hop who’s name begins with “C,” it’s probably in this beer. Six additions of Chinook, Crystal, Centennial, Cascade, CT2, Challenger and Cluster hops make Son of C-Note register on the upper end of the hops scale. Great Western pale and Crystal malts combined with flaked oats provide the malty backbone. Rock Bottom Oud Heverlee – This beer is steeped with both Belgian tradition and its correspondingly unusual ingredients. Dried tulips add a “weet niet het” flavor in the local vernacular – sort of a floral-crossed-with-umami kind of thing. Also, only specially-aged “vloer suipt” Sterling hops are used to bring out their best, most “noble” flavor. The Belgian-style yeast brings out notes of pepper and apricot. Surly Bitter Brewer – On top of its base of 2-row pale ale malt, Simpsons Golden Naked Oats, crystal malt and roasted barley gives this beer its extra smooth, slightly sweet taste and dark amber color. Glacier hops are used as first-wort hops, in the whirlpool, and for dry-hopping, with Columbus for additional bittering. The result is a malty, moderately-hopped, highly drinkable session bitter. 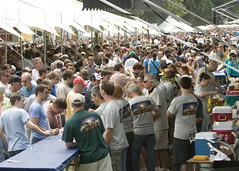 Please visit the Oregon Brewers Festival website for more information.